Whether you need to install a new garage door opener or an old one repaired, just contact us. At Whitby Garage Doors, we are known for delivering exceptional quality garage door opener installation, repair and maintenance services in Whitby and Oshawa. 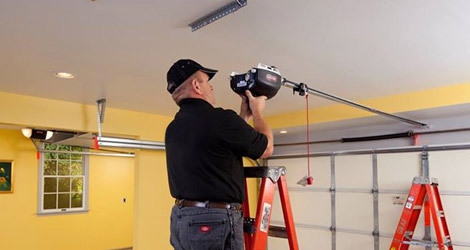 We have a team of highly trained and experienced technicians who can repair and upgrade your garage door opener efficiently. No matter what kind of issue you are facing, our adroit technicians will take care of all your issues efficiently. A garage door system consists of various electrical and mechanical components and they all should work in sync. If they are not properly aligned, the operation of the opener can be adversely affected. This can also reduce the service life of your door opener. In such condition, it is advisable to take necessary measures to make sure your garage door continue to work for a long time. If you have a room positioned above or adjacent to your garage door, this can be the best choice. Belt-driven openers are quiet, smooth and reliable. For locations with extreme climates, screw-driven door openers are an ideal option as they run smoothly in both cold and hot temperatures. These openers are meant to lift heavy wooden or insulated garage doors. They are reliable and perform for years to come. Chain-Driven openers are available in several models and sizes to fit your needs. An automatic garage door opener can add convenience to your life. But, you need to choose the right opener for your property and also make sure it is installed in a proper and professional manner. For all your garage door opener sale and installation needs in Whitby and Oshawa, you can count on our professionals. Call us today for professional garage door opener installation.